Any plaster, dressing, medication etc. 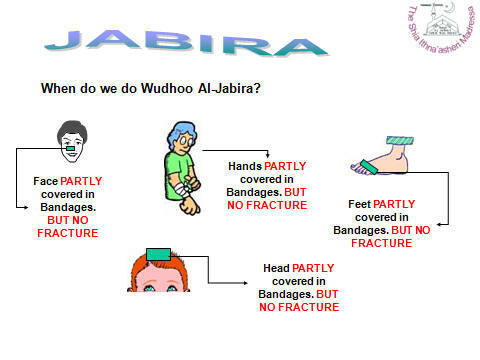 which is applied to a wound, boil, or broken bone is called jabīrah. Jabīrah wuḍūʾ is the wuḍūʾ which is performed on the jabīrah when it is on one of the parts of the body that must be washed or wiped. 1) If the wound, boil, or broken bone is uncovered and water is not harmful for the person, then wuḍūʾ must be performed in the usual manner. 2) If the wound, boil, or broken bone is covered and the jabīrah can be removed without causing any harm or excessive difficulty and water is not harmful for the person, then one must uncover it and perform wuḍūʾ. 3) If water is not harmful for the person but washing the jabīrah is not possible, or, if uncovering the wound causes excessive difficulty or it is harmful for him, he must perform tayammum. 4) If the jabīrah completely covers one of the parts of the body that must be washed or wiped, then performing jabīrah wuḍūʾ is enough. But if all or most the parts of the body that must be washed or wiped are covered, then based on obligatory precaution, one must perform tayammum and jabīrah wuḍūʾ. 5) If the jabīrah has covered more than the normal area around the wound and it is not possible to remove it without causing excessive difficulty, one must perform tayammum unless the jabīrah is on a part of the body that tayammum is performed on, in which case it is necessary to perform both jabīrah wuḍūʾ and tayammum. 6) If the obligation of a person is to perform tayammum but on some of the parts of his body on which tayammum is performed he has a wound, boil, or broken bone, he must perform jabīrah tayammum according to the rules of jabīrah wuḍūʾ. 7) If a person does not know whether his duty is to perform tayammum or jabīrah wuḍūʾ, the obligatory precaution is that he must perform both. 8) If there is an uncovered wound, boil, or broken bone on one’s face or arms and the use of water would be harmful for him, then the area adjoining it must be washed from top to bottom. And if it would not be harmful to draw a wet hand over the wound, then it is better to draw a wet hand over the wound and to place a pure cloth over it and to draw a wet hand over the cloth. 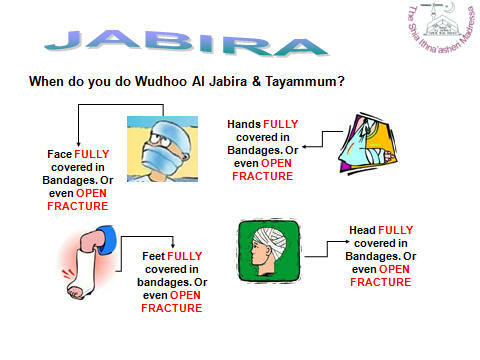 However, in the case of a broken bone, instead of jabīrah wuḍūʾ, tayammum must be performed. 9) If there is an covered wound, boil, or broken bone on the face and arms and it would harmful to uncover it and pour water over it, then the adjoining area must be washed as much as possible; and based on obligatory precaution, one must also wipe over the jabīrah. 10) If there is an uncovered wound, boil, or broken bone on the front part of the head or on the feet and one cannot wipe it, he must perform tayammum; and based on obligatory precaution, he must also perform wuḍūʾ and place a pure cloth over it and wipe over the cloth with the wetness of the wuḍūʾ water left on his hand. 11) For all ghusls, except the ghusl given to a corpse (ghusl mass al-mayyit), jabīrah ghusl is performed like jabīrah wuḍūʾ. However, based on obligatory precaution one must perform it in sequence (i.e. as ghusl al-tartībī). 12) If there is a wound or a boil on the body, one has the choice of performing ghusl or tayammum. 13) If it is not possible to uncover a wound but the wound and the jabīrah that has been placed over it are pure and making water reach the wound is possible and not harmful, then one must make water go over the wound from top to bottom. If the wound or the jabīrah is impure and it is possible to wash the jabīrah and to make water go over the wound, one must wash it with water and at the time of performing wuḍūʾ he must make the water reach the wound. 14) The prayers that one performs with jabīrah wuḍūʾ are valid and he can perform subsequent prayers with that wuḍūʾ as well. ‘Jabīrah’ refers to the thing with which a wound or a break in a bone is bandaged, and to medication that is applied to a wound etc. Ruling 323. If on one of the parts of the body on which wudū’ is performed there is a wound, boil, or broken bone, in the event that it is uncovered and water is not harmful for the person, he must perform wudū’ in the normal manner. Ruling 324. If a wound, boil, or broken bone is on one’s face or arms, and it is uncovered, and pouring water over it is harmful, then the area around the wound or boil must be washed from top to bottom in the manner that was explained with regard to wudū’. And if drawing a wet hand over it is not harmful, it is better that one draws a wet hand over it, places a pure cloth over it, and then draws a wet hand over the cloth as well. As for the case of a broken bone, it is necessary to perform tayammum [instead of jabīrah wudū’]. Ruling 326. If a boil, wound, or broken bone is covered, and uncovering it is possible without causing excessive difficulty, and water is not harmful for the person, then he must uncover it and perform wudū’, irrespective of whether the wound and suchlike is on the face or arms, or on the front part of the head, or on the feet. Ruling 327. If a wound, boil, or broken bone that is covered is on the face or arms, in the event that it is harmful to uncover and pour water over it, one must wash as much of the area around it as possible; and based on obligatory precaution, one must also wipe over the jabīrah. ““Ruling 329. If the jabīrah completely covers one of the parts of the body on which wudū’ is performed, then performing jabīrah wudū’ is sufficient. However, if the jabīrah covers all or most of the parts of the body on which wudū’ is performed, then based on obligatory precaution, one must perform tayammum and jabīrah wudū’. Ruling 330. It is not necessary for the jabīrah to be made of something that one is permitted to wear when performing prayers. Therefore, if the jabīrah is made of silk or parts of an animal whose meat is unlawful to eat, it is permitted to wipe over it. “Ruling 332. If the jabīrah covers the entire surface of the top of the foot except for an area over the toes and at the top of the foot, one must wipe the places that are uncovered and over the jabīrah that is covering the other parts. Ruling 333. If there are several jabīrahs on one’s face or arms, he must wash between them; and if the jabīrahs are on the head or on the feet, he must wipe between them; and for those places covered by the jabīrah, he must act according to the rules of jabīrah. Ruling 335. If there is no wound, cut, or broken bone on a part of the body on which wudū’ is performed but water is harmful for the person for some other reason, he must perform tayammum. Ruling 336. If phlebotomy32 has been performed on one of the parts of the body on which wudū’ is performed and one cannot wash it with water, it is necessary to perform tayammum. However, if one can wash it with water but water is harmful for him, then he must act according to the rules of jabīrah. “Ruling 339. If someone’s responsibility is to perform tayammum but on some of the parts of his body on which tayammum is performed he has a wound, boil, or broken bone, he must perform jabīrah tayammum in accordance with the rules of jabīrah wudū’. Ruling 340. If someone must perform prayers with jabīrah wudū’ or ghusl, in the event that he knows his legitimate excuse for not performing normal wudū’ or ghusl will remain valid until the end of the time for prayers, he can perform prayers at the beginning of their time. However, if he has hope that his legitimate excuse will expire before the end of the time for prayers, it is better that he waits; and in the event that his legitimate excuse remains valid, he must perform prayers with jabīrah wudū’ or ghusl at the end of the time for prayers; and in the event that he performed prayers at the beginning of their time and his legitimate excuse expired by the end of the time for prayers, the recommended precaution is that he should perform wudū’ or ghusl and repeat the prayers. Ruling 341. If someone keeps his eye lashes stuck together because of an illness in his eye, he must perform tayammum. Ruling 342. If someone does not know whether his duty is to perform tayammum or jabīrah wudū’, then based on obligatory precaution, he must perform both of them. Excerpt From: Al Sayyid Ali Al-Husayni Al-Sistani. “Islamic Laws.” iBooks. Yesterday, you mentioned ‘jabirah’, but postponed talking about it till today. 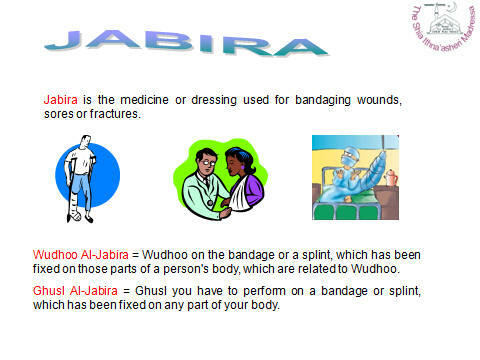 - Yes, if you use any form of dressing on a wound, ulcer, or fracture in any part of your body, it is called “jabirah”. * How should I go about ghusl, wudhu, or tayamum if there was a jabirah on any part of my body? - If the jabirah was of the type that could be removed without any harm befalling you, you may do so; that is, you can wash and/or wipe that part of your body as the case may be. * And if the jabirah cannot be removed for fear of harm or difficulty? 1. The outer part of jabirah must be tahir. You need not worry if the inner part of jabirah, that is close to the body, was najis. 2. [The jabirah itself must not be usurped]. 3. The size of jabirah must be confined to that which is generally accepted as commensurate to the size of wound or injury. * And if it was larger? - You can lift the extra part of jabirah and wash the part of the body under it, or wipe it as the case may be. * Should there be a strong reason not to lift the extra part of jabirah for fear of causing complications to the actual injury, what should I do? - You should not remove it, and wipe the jabirah itself. * What about if lifting the extra part of jabirah proves difficult or may cause harm to the sound part of the body, not the injured one? - You may perform tayamum instead of wudhu, should the jabirah not be present in the parts of the body tayamum is applied to, [otherwise, you must do both]. * Suppose the jabirah cover the whole of my face or the entirety of one of my hands or feet, how should I go about wudhu? - You can do wudhu by wiping over the jabirah. * And if all or most of the parts are covered by the jabirah? - [You should do both the wudhu with stroking the jabirah and tayamum]. * If I had an open cut or an ulcer, and the doctor advised me not to expose it to water, how should I do wudhu? - You can wash the adjacent area to the place of the cut or ulcer only. * Suppose I had a fracture in my face or hand that could adversely be affected if it were exposed to water. What should I do? - You may forsake wudhu for tayamum. * If the open cut, that should not be exposed to water, was in a part of the body that is originally covered by wiping not washing, how should I go about stroking for wudhu? - You could do tayamum instead. * If I choose to do ghusl and I happened to have an open cut or ulcer in my body, how should I go about it? - You could leave the affected area out. Washing the area adjacent to the affected one would suffice. Conversely, you have the choice of performing tayamum instead. * And if I have an open fracture, how should I go about ghusl? - You can do tayamum instead. (g) If something is stuck on the part of wudu, and it is not possible to remove it, or its removal involves unbearable pain, then one should performtayammum. But, if the thing which is stuck is medicine, then rules relating to jabira will apply to it. (l) If the obligation of a person is to do tayammum, and if at some of the places of tayammum he has wound or fractured bone, he should performjabira tayammum according to the rules of jabira wudu.